What Is Stropping And Why Do It? As an introduction to this post I believe it is necessary to talk about what stropping is and why it’s important. Okay, so without further a do let’s dive in and answer the question! What is a strop and what does the process of stropping do? According to Wikipedia, it is simply a flexible strip of leather, canvas, denim or any other soft material used for the purpose of polishing and sharpening a knife and other tools. If you’ve ever been to your neighborhood barbershop, you may have noticed your barber drawing a straight razor along a leather belt. This is the process of stropping and it’s important in maintaining the sharpness and edge of your knives and tools. Most people believe that stropping a knife only realigns the sharpening edge, but there is a lot more that actually happens if you analyze it from a microscopic level. Scienceofsharp does a fantastic job of explaining what stropping actually does and provides magnified images explaining the process. I will not go into all the details, but stropping not only realigns an edge (removing dings and notches), but also burnishes (metal movement – think of this as polishing), abrades excess metal, and coats the knife. If you are interested in the science of stropping, I strongly suggest you check out scienceofsharp, where you can read about the technical details of stropping. Important: At what stage should you strop your knife/blade? I typically strop my blades once I have completed the process of knife sharpening. Knife sharpening (electric or otherwise) is the process of metal removal with the use of an abrasive (diamond stones/grits are an example). Stropping after knife sharpening gives the edge a smooth, clean, polished look akin to when the knife was first purchased; Therefore, I recommend stropping as the last step of the sharpening process. Remember to exercise caution when sharpening and stropping your knives and tools. It does not take much force/effort to cut yourself with a sharpened edge, so be careful! Make sure your knife is clean. Rinse your knife thoroughly with warm water and dry it down with a towel before starting to strop. The most important rule: Never cut into your strop! 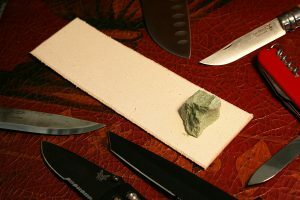 If you recall, knife sharpening is when you cut against the abrasive (stone/grit); Stropping is the exact opposite/reverse. Instead of moving your knife forward to “cut in” as is done when sharpening, you will draw your knife in a backward motion repeating for each side multiple times. Visualize and go for a couple of practice draws! This will help with developing the right technique. Do not rush and try to really emphasize following your edge through. Load the strop with stropping compound. I use the Woodstock D2902 1-pound green extra fine buffing compound. It comes in a 6.6 x 1.9 x 1.3 inches block, so it last’s a hell of a lot of time! Rub it onto your leather strop like you would color a crayon. Careful not to get too thick a layer on though. Now you can start stropping! Now that you’re ready to strop, below is a cool video from cutlerylover demonstrating the process. Remember to follow your edge through and to never cut into the strop! Below are my 3 favorite leather strops for knife sharpening. The more expensive strop does not necessarily make it better than a cheaper one! As always, shop wisely and take your time to do the research, as what satisfies my needs may not satisfy yours and vice versa. 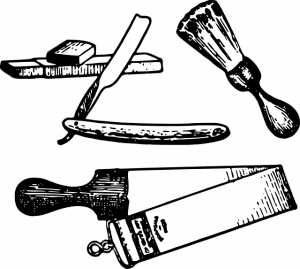 It’s also important to understand that the topic of knife sharpening and stropping tends to be quite subjective, and different tools with different prices can produce similar or close results. This is my favorite of the 3 leather strops for knife sharpening. The 8” X 2.5” solid block means you have plenty of room to work on larger knives. Another cool feature about this strop is that it comes pre-loaded with a high chrome rouge compound, which means you don’t need to apply any compound beforehand. If there was a leather strop i’d recommend anyone and everyone to use, it would be this one simply because it is so easy and seamless to strop with! This paddle strop is slightly larger than the one above, measuring at 11.8” X 3” X 0.8”. It comes with double sided leather strop (vegetable tanned leather), and includes a bar of both green oxide chrome compound and black emery compound. It’s a great starter kit and like the strop above, it offers ample of room to work on larger knives. I’d lean more towards a strop like this one if you’re looking at stropping different kinds of knives and tools. The only con with this strop is that it lacks “how to” instructions (but who really cares! you can find everything online these days anyways!). If you’re on a budget and are looking to find a quality leather strop for cheap, then look no further. This measures about 8” X 2.2” of quality handmade leather and comes with 5 ounces of green polishing compound. If you wanted to, you could attach it to a block of wood or a board, so that there is no movement while stropping. That’s it people! My 3 favorite leather strops for knife sharpening! As always, I love to hear what you think, so please drop me a comment below. If you have experience with stropping and there is something you’d like to share that could be useful to someone else, please do so! The comments will benefit everyone. Thanks for reading and till the next one! Great post! I am not too familiar with stropping which is why I wanted to understand more about the topic. In that sense, your post makes it very easy to understand. I sharpen kitchen knives, but I want to start stropping them too so I can have that polished finish. I am not looking to spend much on the leather however, so I will most likely pick the third (and cheapest) recommendation. Would you say this would be a good choice if I am sharpening kitchen knives only? Thanks for dropping a comment. I understand that knife sharpening (especially when discussing in detail) can be a little intimidating at times, so I try to dumb it down so everyone (including myself!) can better understand/relate. Be careful what you read as there tends to be a lot of conflicting advice on the internet. The 3rd recommendation would work just fine for your kitchen knives! Thanks for reading! Never knew that leather strops were/could be used to sharpen knives. I did know that leather strops are used to sharpen straight razors but I’ve only ever seen knives sharpened using an oil/whet stone……What would be the result of sharpening with an oil/whet stone and then not choosing to strop versus doing both the sharpening and stropping process? I imagine a cleaner, more polished edge if you did both sharpening and stropping, but is it worth the extra effort? Thanks for reading my post. You’re spot on! By doing both sharpening and stropping, you ensure your edge is polished, aligned, and at the very best condition it can be in. What this means is that your knife will last longer and require less maintenance (sharpening etc.). I do not see any reason as to why one should not strop at the end of the sharpening process. I hope this answers your question. Cheers! This is great information, and really easy to understand and follow. I have been looking for some solid information on stropping, and how to get my knifes perfectly sharp, without any bumps or notches, just perfectly polished. Technique is important, and the video nails it down bang on! Cheers for sharing! Thanks for reading Ben! I am always happy when someone drops a comment letting me know that the post has been useful to them or that they enjoyed reading. It keeps me motivated to put more content out there. Cheers! Very interesting post. My husband and I were looking for articles on stropping and came across yours. Needless to say, it is very nicely articulated and broken down. The recommendations provided are not too expensive either, so that helps. It may take some time to get the technique down……..thanks again! Thanks for reading. I am glad you enjoyed the post. Yes, it may take some time to strop with the correct form, but once you practice enough it’s a piece of cake! Happy sharpening and stropping! Informative post….I have worked at a meat processing plant for 7 years now and I still find it difficult to get my blades razor sharp. Even though it’s the tool that’s been known to humans the longest, it is still one of the hardest to conquer! Technique is hugely important, I feel for sharpening and stropping blades. Absolutely right! Technique is very important, but as with anything you have to start somewhere. Practice is the only thing that will get you closer to the proper technique and form. Cheers! Interesting….Stropping was a new term to me and I wanted to read more about it before I do or buy anything. Is this the same as using a knife steel to hone the blade? I have a knife sharpener and a steel but I don’t feel like I use them properly especially for frequency and technique. I will be sure to check out the rest of your site to learn more! That is a great question! I will attempt my best to answer it. Honing vs Stropping…..what’s the difference between the two? Let me know if you have any more questions! Cheers! Is it possible finished leather (polished and colored) could be used for stroping? Thanks for leaving a comment. My only concern with the colored and polished leather is it may not hold the stropping compound well. And the other thing is it may be damaged easily by a sharp edge. My recommendation would be to give it a shot anyways! Try it out and let me know how it worked for you. I’m interested to know!